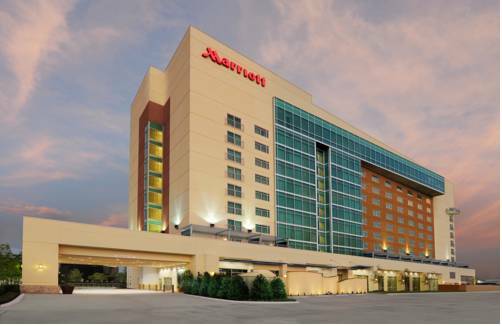 Located near Katy Mills mall and CityCentre, Houston Marriott Energy Corridor provides modern accommodations in one of Space City's most popular districts. Book a balcony room for a private space to take in scenic views, or wind down in one of our sophisticated suites featuring luxury bedding, ergonomic workstations and other sleek amenities. Get the most out of your trip when you stay on the concierge level, featuring complimentary snacks, free non-alcoholic drinks and access to the refined 9th-Floor Lounge. After an eventful day, treat yourself to Texas cuisine with a southwest flair at our restaurant, The Petroleum Grill, or grab a cocktail with a friend or colleague at The Derrick Bar. Guests wanting to stay active while away from home can check out our modern fitness center with cardio equipment and free weights. Whether you're planning your wedding with our expert planners or looking to enjoy the vibrant downtown nightlife, discover comfort and convenience at Houston Marriott Energy Corridor. Catch up with collegues or unwind with your favorite drink, with water wall and al fresco seating. Lunch and Dinner served.